oogle makeup: My favourite highlighters! "Wow, you look great - Glowing!" I beamed with gratitude at this praise... but knew I was indebted to my Guerlain Sun in the City, which - despite it being a 2012 collection, had only just been unveiled at my local counter. The episode made me realise: I haven't shared my favourite highlighters!!! Well as an Estee Lauder doublewear foundation addict, I have always had to put the glow back in. Doublewear is amazing for oily skin but it does make one look rather flat. My favourite highlighters are those which look dewy and moist and gleaming (as opposed to frosty or glittery). 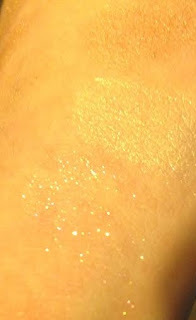 My first encounter with a delightful, almost liquid finish, highlighter was Guerlain Cruel Gardenia. Apparently one can still find this at airport Duty Free so be on the lookout! This is probably my favourite... Well gosh, no all these are favourites. I have others, namely liquid ones and cream ones, but I've found that for longevity and that liquid effect, the gelee type formula AKA extra dimension (Estee Lauder and MAC terminology respectively) are the very very best. I don't like lilac pinks and purples, but a soft warm pink works well. 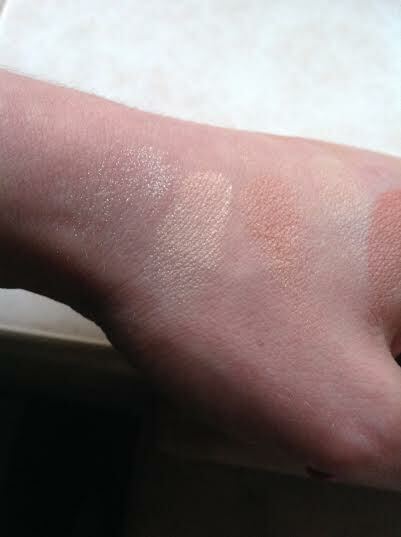 I find lilac tones like NARS Luxor or Urban Decay Afterglow make my pale skin look like a gleaming corpse. I prefer looking like I have the angelic heavenly light of pure sunshine. I sold my MAC Whisper of Gilt, I've spoken about this before - it was amazing - but I did get the latest evocation of MAC's delicious Extra Dimension skinfinish formula, Oh,Darling. It's a close cousin of Whisper of Gilt but not quite as wonderful. Having said that, once I got my hands on Anastasia So Hollywood, all mourning for Whisper of Gilt ceased. So Hollywood is paler than Oh,Darling and has that very slight murmer of pinky peach about it which I so loved in Whisper of Gilt. Oh,Darling is a gold with a burnt orange murmer rather than a pinky peach one. It almost gives a tan effect. The gleam on all these formulas makes them all exquisite regardless of shade tones. As I was saying, I only just got my hands of this, and it's got to be the grandaddy of these wet look highlighters! I imagine Guerlain was the first to seize upon this formula. At any rate, look out for MADE IN ITALY and the ingredients: "GLYCERIN" and also often "SQUALENE". These two moisturising and skin-loving ingredients seem to be the secret to finding winning formulas. I tried to swatch Guerlain Wulong powder next to the Sun in the City (5th swatch) but it's rather faint. On the face however, Guerlain Wulong; Guerlain meteorites and pressed meteorites; Laura Mercier Secret Brightening powder; Benefit Powderflage, and the Estee Lauder loose powder from the Cyberwhite range, all give soft glowing finishes and in photos as well as real life, they make a huge difference. 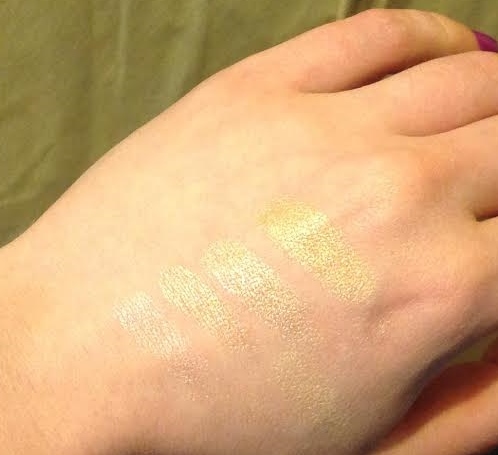 Swatched here (below and between MAC Oh,Darling and Anastasia So Hollywood) I've tried to show Becca loose pigment in Hyawatha (which I pressed into a pan) but it's rather hard to detect. 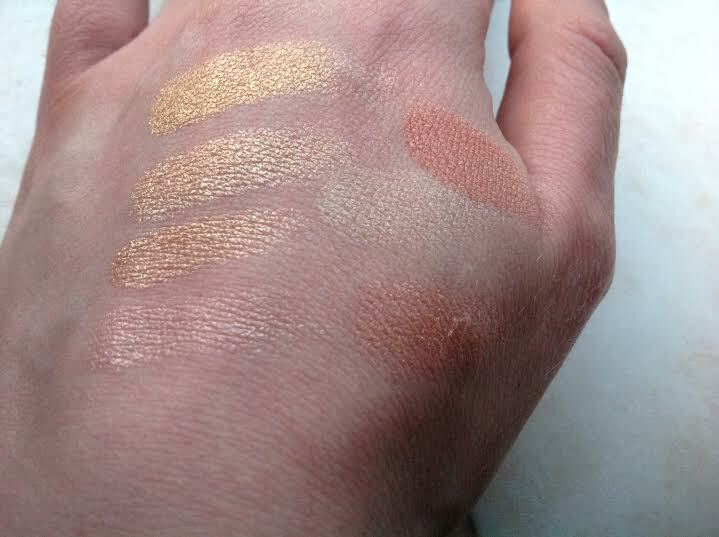 These are in the category of all over brightening veil rather than strategic highlighters. Staying with loose pigments, MAC pigment in Vanilla is another safe bet. It's a pale gold with a pinky duochrome reflect. A guilty pleasure of mine is Illamasqua Beguile pigment. It's rather gritty and sandy textured, and let's face it it's essentially a loose glitter - but I love the way it looks like drops of water. It looks terrible in daylight and rather garish at the best of times, but for nights or evenings when you feel joyful and want to let the magpie spirit free - it's such wonderful stuff! It's white - but reflects blue and green and pink and purple and gold...! 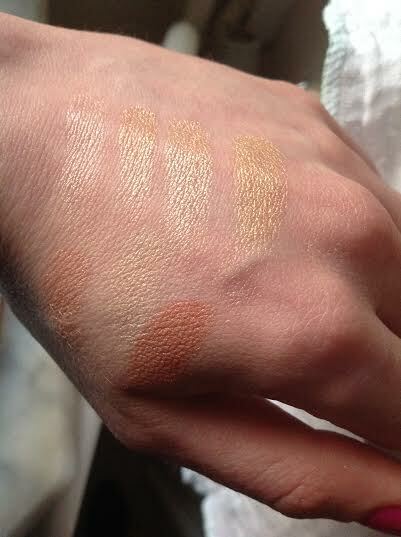 I must mention - without veering into favourite glowy blushers of course - the beauty of Laura Geller Blush n Brighten. I have chosen Pink Grapefruit here. I threw away all my MAC mineralised blushers! I used to adore the likes of Daft Pink and Moon River (youth, sob) but now I can only bear the super refined powders. MAC mineralised blushers and, to a lesser extent, the Milani baked blushers, are not as flattering anymore. I also like the texture of Too Faced Pink Leopard which is a similar peachy shade. I often use these lightly with a fluffy brush, as all-over brighteners when I am especially pallid. Nails inc Neon nail polish REVIEW!